All projects are dependent on the participation of a group of people who, through their common practices or purpose, form a ‘community’. Group cohesion and commonality of vision are therefore essential to the sustainability and resilience of a project. Conflicts within community are often the key cause of a project collapsing. Two particular projects in Zimbabwe that, having both run for over 10 years, demonstrated resilience also had inventive and quite radical ways of re-making community: Chikukwa Ecological Land Use Community Trust (CELUCT) in Manicaland and Kufunda Learning Village in Mashonaland. In both these projects, building vibrant and sustainable communities has become the main focus, with food and agriculture being only one element contributing to that overall sustainability. These projects are continuously and consciously building and re-building their communities and there are three inter-connected aspects of this that I wish to highlight here. Participatory practices are integral to both these communities. At Kufunda, I was fortunate to join one of their regular Monday morning community meetings. We all sat in a circle and a ‘talking stick’ was passed around the circle, with all respecting the sole right of the holder to speak (or not to speak) at that time. As the object moved around the circle, each person shared how they were feeling and what had been going on with them in the past week. This patient process is designed to encourage active, democratic participation and honours each person’s unique talent, standpoint and contribution. After this process of ‘tuning in’, specific village tasks and issues were discussed with different issues then passed on to delegated cluster/interest groups. There was no individual leader or ‘chief’; instead all were equally invited to participate in making collective decisions. At Chikukwa, their model of learning also follows a participatory model, having been ‘horizontal’ or ‘peer-to-peer’ since the project began. They started their own “permaculture school” in 1995, where people in the community would take it in turns to address each other on topics that they were deemed to have a particular interest in or experience with. So for example, farmers with a fruitful orchard at home were invited to talk about agroforestry. The community would then be encouraged to put into practice what they were learning, to ‘look and learn’ by visiting good examples and eventually, clusters of specialist groups formed. So the community are their own teachers and all teachers are also learners too. This is not unlike the ‘communiversity’ concept that is active at Kufunda, although there, more trainers tend to visit from elsewhere and their remit is much broader than permaculture. In both projects, various forms of conflict have arisen. As Phineas Chikoshana from Chikukwa put it, “conflicts are everywhere. As an individual, you always have conflicts within yourself (…) and when one is not at peace with him or herself, then that person is bound to have conflicts with others as well. So it’s very important to cultivate a spirit of peace within the community.” In 2006, in response to the emerging community conflicts, CELUCT initiated their ‘Building Constructive Community Relations’ (BCCR) program. This has since, out of a natural necessity, become a central pillar of the Chikukwa project. As time passed and new problems began to arise, (as people worked together in new ways or with new agendas), it was recognized that conflicts (always) arise and so people must know how to effectively deal with them. Through the BCCR program, CELUCT members worked to sensitize each other to conflict resolution methods, in particular the ‘Three Circles of Knowledge’ approach (Westermann 2008), so that the community could move forward and not allow conflicts to destroy what they had achieved. As Phineas shared with me, “development needs peace [in order] to thrive” and so “we must learn how to transform conflict situations”. In other words, as an organization, CELUCT identified that one cannot avoid community conflict and so the project had to integrate these conflict management trainings into their core practice. This, I feel, is likely the key to their success in maintaining a community-led project over such a long period (22 years!). Likewise, at Kufunda, the community has integrated several peace-building tools into their village life, including personal tools for transformation such as yoga, aikido and Warrior of the Heart practices. Like at Chikukwa, the villagers have experienced periods of conflict and crisis but have learnt to (a) expect these as part of community life, (b) to minimise them through community practices and (c) to address them through innovative participatory communication methods. These aspects of community governance have ensured that such projects thrive and endure. As can be gleaned from the brief overview of community governance practices above, both projects stand out as sites of inventive and radical experiment in “what it means to live in community” (Knuth- Kufunda founding member). This obviously has implications for the subjectivities of those participating in such communities. While respecting and valuing many ‘traditional’ (ancestral and gender-based) roles through, for example, gender-specific meetings, consultations and celebrations, both communities have also found ways to adjust or reform power relations to integrate and honour a spirit of democracy. This, I think, has had considerable implications for gender relations and youth subjectivities in particular. In contrast to more ‘traditional’ communities, these villages have empowered women and young people through an emphasis on participation and encouraging the individual spirit, as well as the community, to flourish. Many of the initial and current volunteers at CELUCT, for example, are women, as this is a community with high levels of male-outmigration; men often leave to seek employment on Chimanimani’s forestry estates or in the cities. Patience Sithole, a founding member and one of the original six volunteers, described how the project has acted as an empowering force for women, who learnt how to make their own decisions, manage and solve their problems together and create their own livelihoods through activities such as bee-keeping, jam-making and selling garden produce. The community-led nature of the project also acted to bring people together in a more democratic and constructive way, which enabled issues such as gender violence and abuse to be discussed more openly. Moreover, in the act of coming together to take collective responsibility for problems such as deforestation, soil erosion and flooding, the people also began to address other issues such as HIV/AIDS. In both projects, youth are a central focus and are offered various leadership training programs and are invited to participate in village meetings on an equal footing with elders. They are found to be active leaders in various fields at both sites and this is celebrated and respected by those that benefit from their energy and enthusiasm. This is rather different from more traditional community dynamics where younger people are often expected to be quiet and to honour the wishes of those older than themselves. The third characteristic of these two projects is their active and long-term connections with other communities. CELUCT is funded by various overseas donors and has received international attention in permaculture circles. They now act as a host organisation for training workshops and also have outreach programs. They network and collaborate with other regional organisations such as TSURO and Kufunda. CELUCT host conflict resolution trainings and even ran such a workshop with Kufunda Village in 2013. Kufunda is remarkable in Zimbabwe in the way it is shaped by contemporary emergences at the international level, such as the internet, social media, the global village concept and the transition movement. This is evident in, for example, the inception of the project through an international email invitation. International volunteers and trainers, researchers and visitors like myself, as well as youth trainees, also regularly pitch up and participate, becoming an ephemeral part of the local Kufunda community. Moreover, through social networking sites such as Facebook, such participants are able to maintain an emotional and discursive connection to and involvement with the village. In fact, most of the material donations that fund the youth program and other developments are generated through these online and trans-local connections. Kufunda is thus actively participating in global networks and mobilisations, whilst simultaneously it is embedded in a unique context and constellation of villagers. In communion and connection with other communities in disparate geographical locations, Kufunda receives not only funding and in kind trainings from outsiders, but is also exposed to alternative configurations of power in community, and to wide networks of ‘emotional’ support. This, I suggest, enhances the resilience of the project, which is highly conscious of its own significance and is able to learn from further afield. However, the dependence on outside sources of funding is a risk, common to most of the other projects in Zimbabwe and must be addressed. To conclude, the longevity or sustainability of these two particular projects, I would argue, is deeply connected to their innovative and holistic approaches to community-building. Both projects are attentive to local conditions and traditions while remaining open to cosmopolitan influences. As such, I found that at these sites, people conveyed a broader outlook and sense of interconnectedness, were fluent in global environmental concerns (eg. climate change) and also had a more radical sense of social justice. Moreover, at both Chikukwa and Kufunda, there is close attention and responsiveness to the dynamics of local community, whilst they remain open to (and expectant of) change. Finally, both projects communicated a sense of responsibility to share their experiences and we must thank them, as there is much we can all learn from them about resilient and inspirational ‘re-inventions of community’. Freire, P. (2000) Pedagogy of the oppressed. Continuum International Publishing Group. Hocdé, HJ. E. Vázquez, E. Holt-Gimenez and AR. Brown (2000) Towards a social movement of farmer innovation: campesino a campesino. ILEIA Newsletter, July, 26-27. Holt-Gimenez, E. (2006) Campesino a campesino: voices from Latin America’s farmer-to-farmer movement for sustainable agriculture. Oakland, CA: Food First Books. Kinpaisby, M. (2008) Taking stock of participatory geographies: envisioning the communiversity. Transactions of the Institute of British Geographers, 33: 292–299. Mukute, M. (2009) Cultural Historical Activity Theory, expansive learning and agency in permaculture workplaces. Southern African Journal of Environmental Education 26, 150-166. Murwira, K., H. Wedgewood, C. Watson, EJ Win, and C. Tawney (2000) Beating hunger, the Chivi experience: a community-based approach to food security in Zimbabwe. Intermediate techbology Publications, London. Njovana, E., & Watts, C. (1996). Gender violence in Zimbabwe: a need for collaborative action. Reproductive health matters, 4(7), 46-55. Søndergård, B., Hansen, E. O., Holm, J., & Kerndrup, S. (2004). Creation and sharing of environmental knowledge across communities and networks. Aalborg Universitet. Uphoff, N. (2002) Agroecological innovations: increasing food production with participatory development. London: Earthscan. Westermann, E. (2008) The three circles of knowledge: how to build constructive community relations by understanding conflicts in rural African communities. Tien Wah Press: CELUCT. Wheatley, M., & Frieze, D. (2011). Walk out walk on: A learning journey into communities daring to live the future now. Berrett-Koehler Store. Wolf, P. R., & Rickard, J. A. (2003). Talking circles: A Native American approach to experiential learning. Journal of multicultural counseling and development, 31(1), 39-43. Woolcock, M., & Narayan, D. (2000). Social capital: Implications for development theory, research, and policy. The world bank research observer, 15(2), 225-249. This garden project has 42 members and operates on 4 hectares of land in Dewe Village, Matopos. This is in the dry Matebeleland South Province of Zimbabwe. The project is facilitated by the Fambidzanai Permaculture Training Centre in Harare, who provided training in permaculture and business skills, and currently offer on-site support in the form of Mr Crispen Dungeni, who is a FPTC staff member based in the area. The project focusses on household and community consumption and therefore grows a traditional array of vegetables including chomeolia (kale), spinach, onions and tomatoes. They also practice agro-forestry and so we find pawpaws and banana trees here too. The garden is organic, but the farmers I met on site here were not especially clued up or passionate about this aspect. The emphasis here was on improving community nutrition and supporting those in need, such as the elderly, AIDS orphans and the sick. Importantly, this is also a livelihood project, generating income for the mainly female members who cultivate the garden. This makes a huge difference in a place such as Dewe Village, where there is little cash-based employment and families need to find money to pay for school fees and basic goods. Mpumelelo Organic Community Garden from Pamela Ngwenya on Vimeo. Belinda Sparrow-Smith of Bulawayo undertook a short course in permaculture in South Africa four years ago, specializing in Mandala Domes, or mobile chicken-runs. On her return home, she started a small commercial project in her own backyard, driven by the need to raise funds to pay her children’s school fees. The project revolves around keeping chickens in mobile domed enclosures, or ‘chicken tractors’ and after moving the chickens, planting organic lettuce and salad crops in the ‘mandala’. Chickens are kept in one mandala for 2-3 weeks, where they naturally fertilize and aerate the soil, picking out weed seeds and preparing the soil for planting. So when the chicken enclosures are moved on to the next mandala, a rich, fertile manure, perfect for planting, is left behind. Belinda also makes her own organic compost from cut grass, garden and kitchen waste, and cow manure bartered from nearby farmers. No artificial chemical fertilizers or pesticides are applied in this beautiful garden. 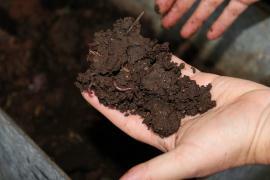 Vermiculture (or worm-farming) is practiced, in a ‘lazy’ fashion, says Belinda. 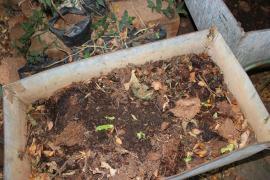 This involves keeping a wormery- a breathable box- which has a worm-laden compost layer at the bottom. On top of this, waste kitchen peelings are added. The worms must be kept moist and in the shade to avoid over-heating. 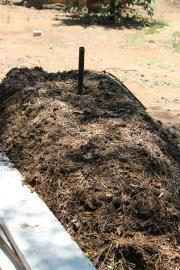 The worms digest the organic material and in the process, generate an extremely rich compost that is added to the garden soil. On the outside edge of the salad beds, Belinda often grows other plants to form a barrier, which helps to keep out running grasses. She also grows kitchen herbs in old car tyres and on reclaimed rubble piles. As well as providing tasty additions to the cooking pot, such plants help to stabilise the soil, repel pests and attract pollinators. Other plants are grown for their specific qualities as ‘green manure’. These are living plants that naturally enrich the soil, such as comfrey and lucerne (also known as alfafa). Lucerne is an insectary plant; a place where insects congregate. In organic farming, this is considered helpful to other (food/cash) crops when the two are inter-planted. The lucerne attracts predatory and parasitic insects, thereby protecting the lettuce. Belinda also feeds lucerne to the chickens, who literally jump for it; being protein-rich, it is a great forage crop and helps promote egg growth and strong shells. Another important aspect of permaculture applied in this garden is agroforestry- integrating the planting of trees with ground crops. Trees provide valuable shade and fruits, as well as stabilizing soil structure and water holding-capacity. They also attract wildlife to the garden, making it a wonderful place for children to learn about and interact with the natural world. In addition to rotating the chicken domes around the mandala garden, it is also important to rotate plant crops, for example by planting beans/peas for one season, and planting lettuce next time. Legume crops naturally enrich the soil with nitrogen and such rotation helps to maintain a balanced soil nutrition profile. The circular mandala design makes the garden really easy to manage; it also makes it a nice place to play and walk around. Selling to local hotels, restaurants and more recently supplying Food Lovers Market, this commercial home-farm project produces about 1400 lettuce a month, as well as up to 50 delicious free range eggs per day, which are sold to friends and used at home. Accessing strictly organic food in Bulawayo, as any concerned person is aware, is tricky. There is a lack of awareness of the benefits of organic food throughout the food chain, from farmer to retailer to consumer. The recent introduction of the ‘Zim Organic’ label- a national organic certification scheme- may help to guide concerned consumers in their food choices. In the meantime, we must thank conscious producers such as Belinda for their invaluable and delicious contribution of high quality, healthy, organic salads for us to enjoy! Mountain of Hope is an organic farmers association with a community garden project, founded in 2011. The project is jointly facilitated by the Fambidzanai Permaculture Training Centre (FPTC) and the Zimbabwe Organic Producers Association (ZOPPA) based in Harare. While the FPTC provides training for the farmers in organic production methods, organisational management and business skills, ZOPPA are working with the farmers to ensure that ‘organic’ criteria are met to the international standard required by the new ZimOrganic certification scheme. The farmers in the group democratically elect a committee and regularly hold meetings. They are guided by ‘lead farmers’ who receive trainings from the FPTC and are then required to pass on their skills with the rest of the group. When I visited the site in May 2012, farmers Catherine Manhando and Rachel Taruvinga told me that the project has been successfully contributing to household food security, firstly by providing a rich variety of vegetables for the family pot, but also through income received via sales of organic produce. The project and project members sell to neighbouring households, nearby boarding schools and to supermarkets in Harare. The ‘Organic’ movement is not widely recognised in Zimbabwe, although there are important pockets of concern and interest, and therefore a small market does exist. However, the ZimOrganic certification program is still in its infancy and requires much broader publicity. ZOPPA bemoan that organic producers are still unable to demand a premium for their goods, as retailers and consumers are unwilling (and in many cases unable) to pay extra. However, as can be gleaned from lead farmer Didymus Taruvinga in the short video here, concerns about the health consequences of conventional food production are growing in Zimbabwe, especially given the context of high levels of HIV/AIDS, diabetes, cancers and other serious health issues. The association members are confident about the sustainability of this project, citing the increasing demand for and awareness about organic produce, the strong support from a local boarding school that purchases from the site, and also the multi-skilled ‘get up and go’…‘we can do this for ourselves’ attitude that the members have cultivated in developing this project. The project also has the full support of local traditional leaders, who allocated the project land on which to develop the community garden. One of the key challenges identified by the four female farmers that were interviewed here was a lack of policy support at the national or provincial level; government extension services remain staunchly pro-conventional in that they support the distribution of chemical fertilizers and pesticide sprays, yet do not provide trainings in nutrition and organic methods of production. Other challenges that were cited revolved around a lack of capital to invest in key infrastructure such as fencing, irrigation piping, a water pump, and transport to take their produce to market. The ZimOrganic label requires strict adherence to organic principles and this requires discipline and constant participatory monitoring of member activities, which may also prove to be a challenge should institutional support dry up. The garden itself was impressive; well-kept beds, mulched and highly productive. They grow a wide variety of upmarket vegetables including baby marrow, broccoli and baby gem squash. It was interesting to hear how the farmers were incorporating this new range of produce into their own diets as typically, rural Zimbabweans grow and consume mainly spinach, kale, beans, tomatoes, onions, sweet potato, squash and seasonal indigenous vegetables. It is rare to find broccoli and suchlike in a rural community garden project. The farmers here were very positive about their expanding diet and nutritional knowledge base, but the main focus was on selling this range to the more urban markets where a higher profit margin could be reaped. It was a humbling and encouraging experience to tour this young garden, where community farmers are investing their immense energies in learning and creating something healthy and positive to uplift themselves, foster a healthier nation and protect their environment. The project is in its early days but it is clear to see that this garden is indeed a monumental Mountain of Hope in a landscape of increasing environmental degradation, conflict and human disease. Let’s all hope that this project will continue to rise with the tide of growing ‘organic’ awareness. Introducing Mountain of Hope organic farmers association, (high resolution) from Pamela Ngwenya on Vimeo.